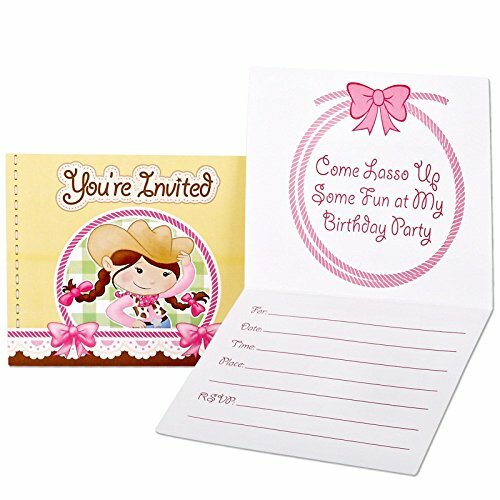 Ellasmommy2009 Absolutely love this theme and the invitations are perfect for all little cowgirls! ilovethissite These were much bigger than I thought. I like the message on the inside top, but it is big enough to put a picture of my daughter (wearing a cowboy hat) on it. margieVG These are really sweet invitations! The paper is thick and the size leaves plenty of room for all needed information. We did have to pay a small amount of additional postage because of the size of the envelope, but it was worht it! partytimegirlz These are really sweet invitations! The paper is thick and the size leaves plenty of room for all needed information. We did have to pay a small amount of additional postage because of the size of the envelope, but it was worht it! niknik These invitations are adorable! I added personal western touches when filling them out. For example Cowgirl, Ranch, buckaroo's. Just use your playful imagination. partythrowingmommy I love these invitation because they are stirty, cute, and leave plenty of room party details. Look exactly like picture. scrapbookgirl I ended up making my own invitations which were much cuter and still went with the theme of the party. Veronica87 These cards are soo cute!! My daughter loved them and there very durable paper! Definetly a plus! Includes (8) Invitations with envelopes.